Today was a horrible day for me. 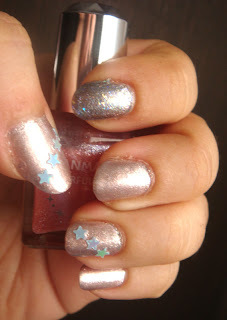 I am not sure how long it will take but I will try to share some swatches, hauls and previous manicures plus a couple tutorials I had prepared and hopefully my poor hand will be as good as new soon. 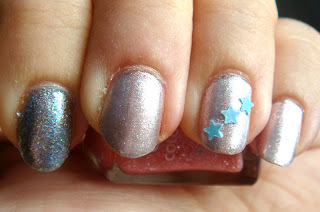 So for today I have the followup on the foil manicure to share. As I wanted to spice it up a bit I decided some layering was in order. So I used a couple of Canmake nail polishes I had lying around. 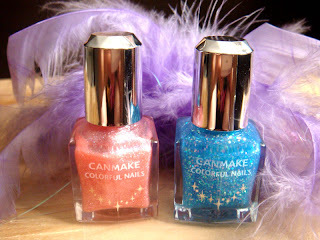 Canmake is a Japanese drugstore brand and their nail polish collection is amazing. Plus the bottles are super cute, yay! I think the outcome was interesting. I liked the blue one better but all in all I am pleased with this manicure. I love the stars. So cute! Ohh, I really hope your thumb will be better soon and that you will not have too much pain in it. Yikes, poor thumb! Hope it heals quickly. Those Canmake bottles are cute indeed.